It's COLD in Bermtopia right now. Not just your basic end-of-January cold. I'm talking teeth-clenching, toe-curling, soul-sucking cold. Blame it on the fog -- and the berms. 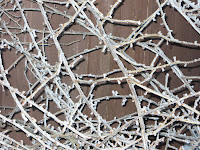 This type of cold, combined with fog, results in an interesting phenomenon -- hoarfrost. Derived from the word hoary --adj. 1. Gray or white with or as if with age. 2. Covered with grayish hair or pubescence, as some leaves. 3. Very old. 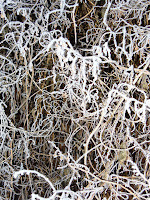 "Hoarfrost" sounds ominous, I grant you, but actually it can be quite spectacular when multiple layers of hoarfrost start to coat the trees and shrubs in my neighborhood. 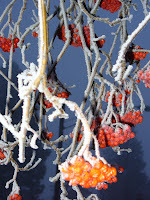 First, a soft dusting, then a frosting, and finally crazy spikey pins and needles of ice. Since I started this post, the fog has finally lifted and cooler, clearer nights prevail. The neighborhood landscape is a bit more cheerful -- and boring. Did I really say that?